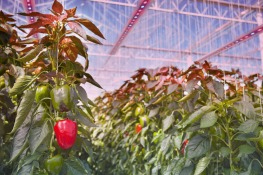 OSRAM Opto Semiconductors is expanding its LED product range for horticultural lighting with a new type of the well-proven OSLON SSL. In addition to the existing hyper red (660 nm) and deep blue (450 nm) versions, the high-tech company developed a far red OSLON SSL LED with a wavelength of 730 nm. For certain plants such as tomatoes, peppers or roses, it is exactly this wavelength which leads to better growth. Customers now have a better coverage of the color spectrum for their horticulture applications with this new LED now available.